Cancun city - To grrr, or not to grrr? That is the question. ljtourist and I got up very late this morning. When we looked out the window we could see it very windy on the beach with a high risk of rip tides. So, we decided to head into town and check out the sights and shopping. We took the bus to save on costs and they are pretty zippy about getting you around and it's only 6.5 pesos (65¢). We got into town and tried to hit Market 28 to see what they had. As soon as we walked into the area we were literally harassed at every turn. After about 2 minutes of this we got the hell out of there. They were very aggressive and rude. How do they attract visitors like this? I just want to browse, but it was not possible to do in peace. The only reason I can think of is the "Le Blanc" bracelet that we had on. The hotel we are staying at is all-inclusive and it's not cheap. I think that made us a huge target as big money spenders. It's not something we could remove. We walked around the city some more to check out things and ended up heading over to Isla Mujeres. We took the ferry from Puerta Juarez in Cancun. This is a high speed ferry (people only) and round trip cost 70 pesos ($7.00). It was a cool boat to ride in and very comfy. 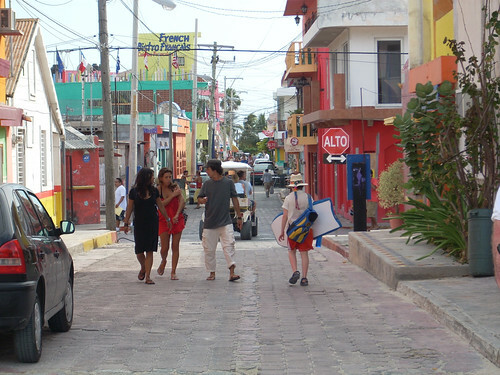 Once in Isla Mujeres we walked around the streets. This was a very different place with very few cars (I did see a car with a tag from North Carolina and one from New York, amazingly) and lots of scooters and golf carts with monster wheels. It was a very different setting with outdoors bars, outdoor beds with curtains next to the beach, swings for chairs in the bars and very outdoorsy. It was definitely more calm than the city. We met up with other people from the ljtourist's group and headed back on the ferry and then shared a cab back to the hotel. When we got back to the hotel, one of the hotel staff came dashing out of the front door with very cool (almost cold) towels to refresh with. I used to think this was a little over the top, but after being hot int he city all day and all of the traveling we did, everyone in the group welcomed it. This happened anytime we walked in through the hotel fronts doors. After a quick dip in the pool we headed out for dinner. While the hotel was all-inclusive, the menus get old after awhile and you crave something different. We learned that Le Blanc is part of a chain of hotels here in Cancun (5 in all) and Le Blanc was on the top of the list. As guests of this hotel we could go to any of the other hotels for food and it's part of the all-inclusive costs. We did find some really good food and head a great time with the entertainment. Although we quickly appreciated the policy of the Le Blanc that does not allow any guests under the age of 18--enough said. We checked out another hotel down the road just to see what it was like and liked it as well. Got back to our hotel and dashed out for the fire dance that just started. This was some amazing stuff watching the dancing with fire and flames creating a spectacular light show. All of this was done with some great dance/trance music. This went on for about a half hour and we finally retired to our room for the night. Damn, what a long day. Took me forever to compose this post, but glad I captured it all. Tomorrow will definitely be lazy day and then I fly back on Sunday. I regret leaving this warm and beautiful place and my Spanish is improving. However, I will also be glad to crawl back into my own bed. Joe, this is so cool looking. So different than American style towns.